Welcome to our Online Patient Center! Here you can get information about what to expect during your visit with Dr. Marra and Dr. Tucker as well as important forms you can complete before your appointment to save time. When you visit our office, you will be warmly welcomed and we can answer any questions you may have about completing the patient paperwork so that Dr. Marra & Associates may see you. Our team will work together to evaluate your eyes and provide relevant eye care treatment information, review your vision benefits and payment options, fit you for glasses or contact lenses, and focus on exceeding all of your expectations. If at any time you have questions about the process or your specific health information, please ask. Please download and fill ou the following form. Now you can easily order your contacts online. A current prescription is required and must be on file at our office. My first visit to this office was last week and I could not be more pleased. Dr. Marra was great and the customer service was awesome. I will be returning! Dr. Marra & Associates believes in providing the best value for you and your family. We have products and pricing that aims to accommodate all budgets and our office participates in most insurance programs. For patients who have little or no vision insurance coverage, flexible payment programs may be arranged. To learn more about our payment options, please call our office directly. Our office accepts cash, check, and major debit and credit cards including Visa, MasterCard, and Discover. We accept AFSCME, Eyemed, Frontpath, Medicare, Paramount, Spectera, Superior, Vision Benefits of America, Vision Care, and Vision Service Plan. Donate Your Old Glasses Today! Have you ever wondered what happens to donated eyeglasses? 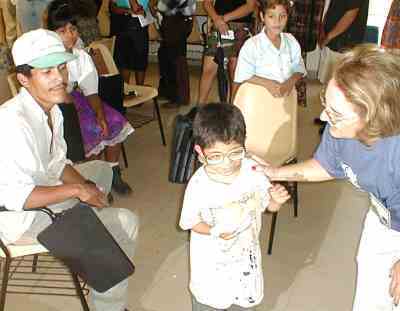 VOSH (Volunteer Optometric Services to Humanity) collects and processes them to deliver to needy third world countries. We use a special auto-refractor to perform eye exams and match the prescription with frame to the person in need of glasses. Each year a VOSH team helps about 5,000 patients with free spectacles. The need for services and glasses due to poverty and lack of eye care is staggering! We thank everyone who donated glasses and supported our practice to allow this to be possible.